Joseph DeLorenzo by John Sommers II for Transport Topics. 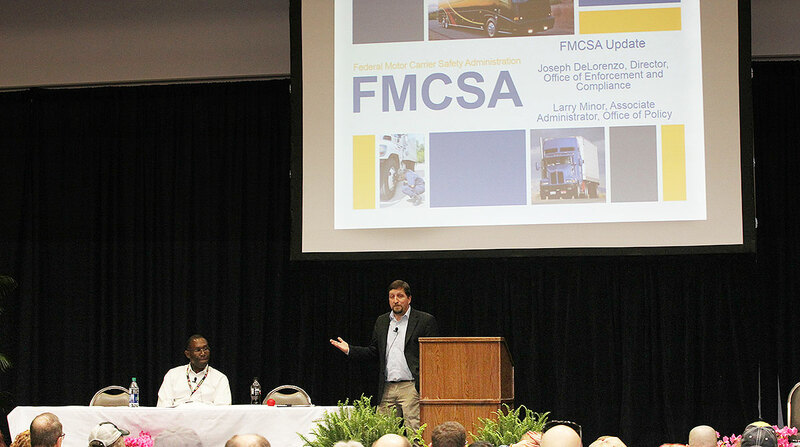 DeLorenzo gave those words of advice during an electronic logging device update session at the Mid-America Trucking Show here March 30. Although DeLorenzo was offering a variety of tips about steering clear of trouble using the devices, it was personal conveyance time — also known as authorized personal use time — that garnered the most questions from drivers. Some common examples of personal conveyance time include time spent traveling to lodging, restaurants or entertainment venues, time spent traveling to a reasonable, safe location to obtain required rest or moving a truck at the request of a safety official during the driver’s off-duty time, DeLorenzo said. A driver cannot use the time for the sole purpose of advancing the freight or time spent transporting a vehicle to a facility for maintenance, he said. There are no specific time or distance limits for legitimate personal use movement of commercial motor vehicles. When it comes to the use of ELDs, DeLorenzo said drivers foremost need to know whether they are using automatic onboard recording devices or ELDs during roadside inspections. One of the more common violations regarding both ELDs and AOBRDs involved drivers not knowing how to transfer data to roadside inspectors. In our season 2 second episode of RoadSigns, we ask: What does the future hold for ELDs? Hear a snippet from Norm Ellis, president of EROAD, above, and get the full program by going to RoadSigns.TTNews.com. DeLorenzo encouraged carriers using AOBRDs to make the transition to ELDs now rather than waiting to meet the Dec. 16 deadline at the last minute.